Alex Smith threw for 153 yards, but he fumbled once and was picked off twice in Sunday's loss to Indianapolis. KANSAS CITY, Mo. — The Indianapolis Colts had watched the Kansas City Chiefs march downfield for an easy score on the first series of the game, yet nobody on their sideline seemed to be worried. "There was no panic," said the Colts’ Jerrell Freeman, who had two interceptions. "When they got that touchdown we were like, ‘Aww, it’s OK.’ It’s just execution, and us not trying to panic." 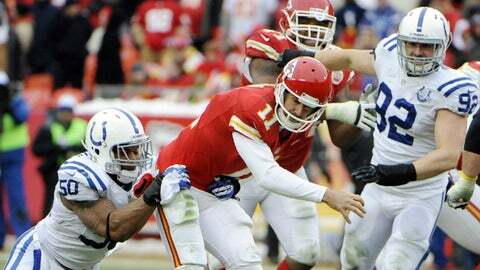 The AFC South-champion Colts (10-5) have beaten the Chiefs in five of their past six games.